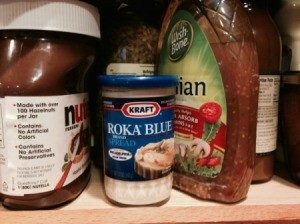 Roka Blue devotees often have problems finding this cheese spread. Making a copycat version is easy. This page contains recipes for Kraft Roka Blue spread substitute. I've seen several requests regarding Roka Blue, so for those of you lovers looking for this discontinued product you're in luck, because I found it. Kraft Kitchen themselves swear this is the perfect substitute recipe for the original! This recipe equals two of the original 5 ounce jars. Mix the cream cheese and blue cheese until well blended; add 1 tablespoon at a time of water (up to 5 tablespoons) for a thinner consistency if desired. Note: For a tangier flavor add 1/2 teaspoon white vinegar.